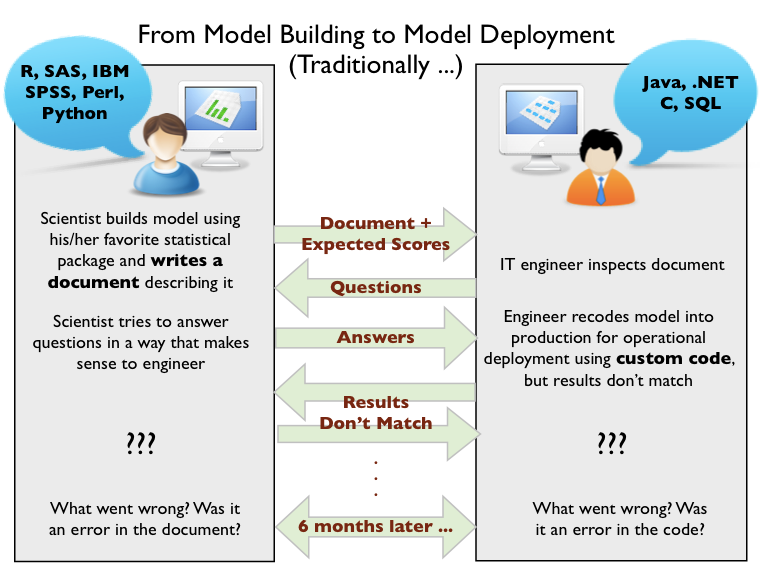 Traditionally, the deployment of predictive solutions have been, to put it mildly, cumbersome. As shown in the Figure below, data mining scientists work hard to analyze historical data and to build the best predictive solutions out it. Engineers, on the other hand, are usually responsible for bringing these solutions to life, by recoding them into a format suitable for production deployment. Given that data mining scientists and engineers tend to inhabit different information worlds, the process of moving a predictive solution from the scientist's desktop to production can get lost in translation. 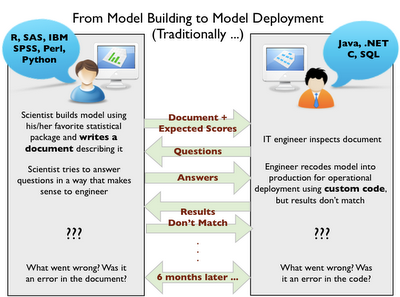 Luckily, the advent of PMML (Predictive Model Markup Language) changed this scenario radically. PMML is the de facto standard used to represent predictive solutions. In this way, there is no need for scientists to write a word document describing the solution. They can just export it as a PMML file. Today, all major data mining tools and statistical packages support PMML. These include IBM SPSS, SAS, R, KNIME, RapidMiner, KXEN, ... Also, tools such as the Zementis Transformations Generator and KNIME allow for easy PMML coding for pre- and post-processing steps. Great! 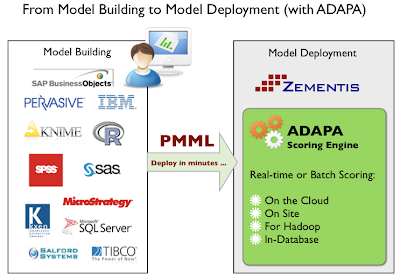 Once a PMML file exists, it can be easily deployed in production with ADAPA, the Zementis scoring engine. ADAPA even allows for models to be deployed in the Amazon Cloud and be accessed from anywhere via web-services. Zementis also offers in-database scoring via its Universal PMML Plug-in, which is also available for Hadoop. In this way, a process that could take 6 months, now takes minutes. PMML and ADAPA have transformed model deployment forever. If you or your company are still spending time and resources in deploying your predictive analytics the traditional way, make sure to contact us. The secret behind exceptional predictive analytics is out!